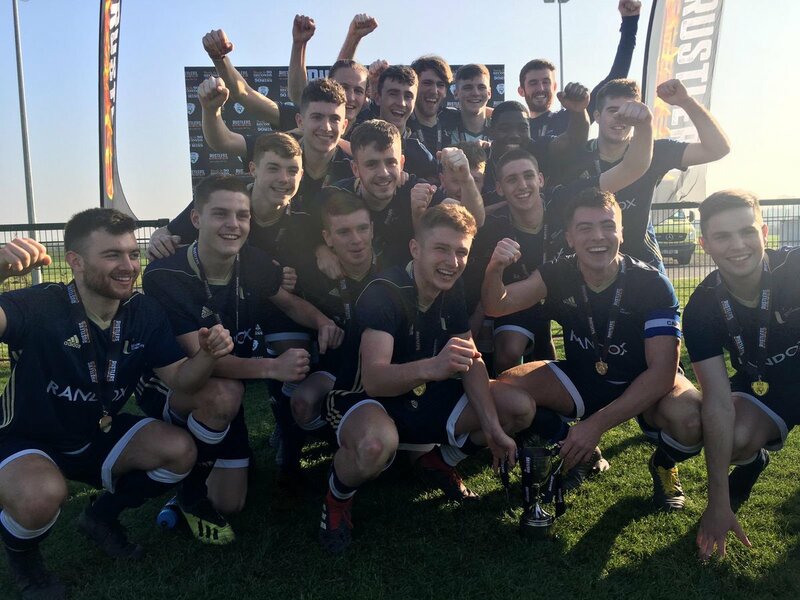 A four goal first half blitz of Maynooth University 'B' saw Ulster University maintain their perfect league record to comfortably take the Rustlers Division Two title in the decider at the FAI NTC Abbotstown. The Ulster side have been hugely impressive all season and have now registered seven straight wins scoring 38 goals with only two conceded and they showed no mercy to their opponents in this rather one sided affair. Man of the Match Jack O'Mahony gave them the perfect start with a fine individual goal within five minutes after easily getting through the Maynooth defence. Joe McKinney did have a great chance to level matters for Maynooth but his finish from close in was weak and Matthew McClurg was able to gather it with ease. Both Callum Moorehead and Darious Roohi then tested Maynooth 'keeper Caoimhin Kelly before the excellent Thomas Maguire doubled the Ulster University score on the half hour. O'Mahony threaded a lovely ball into his path and he finished with some style past Kelly. O'Mahony grabbed his second of the game ten minutes later steering home Moorehead's cross from the left from close in. The game was more or less put to bed on the half time whistle when Maguire was allowed to easily get past the Maynooth defence for his second goal and leave Maynooth trailing 4-0 with a mountain to climb after the break. Unfortunately they were unable to pose any real threat and Ulster emptied the bench and saw out the game with ease to claim the title and promotion to Division One next season. ULSTER UNIVERSITY: Matthew McClurg; Oisin Roper (Marc McKenna 57), Aaron Swann, Owen McConville, Craig Taylor; Ronan Wilson, Jonny Wilson (Marcus Greenfield 76); Jack O'Mahony, Thomas Maguire (Daniel Hamilton 81), Callum Moorehead (Callum McCluskey 86); Darius Roohi (Nick Beta 57). MAYNOOTH UNIVERSITY 'B': Caoimhin Kelly; Eoin Massey (Sam Watkins 41), Cormac Browne (Matthew Mullan 64), Jack Somers, Colm Matthews; Zac O'Neill, Oisin Proudfoot (Conor Coyle h-t), Dylan Hennessey, Joe McKinney (J J Otatunja h-t); Ryan Byrne (Alpha Ike 51), Cian Byrne. Referee: John McCarthy Assistants: Eddie Reilly, Ciaran Redmond.